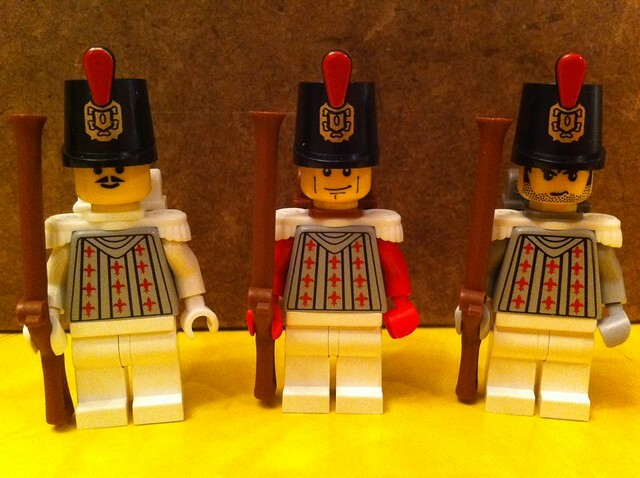 As my army building efforts continue I have decided to create a company of French Royalist soldiers to fight alongside my Redcoats. Those be very nice! But as far as I remember, the Bourbone royalists used white coats in order to be associated with the white flag of the Bourbons. Maybe white arms, then? Since there are no usable white torsos, and I remembered from one of your last posts, that you don't like to use decals, I must say it's really nice, and with the liles on the torso it could work. they look nice, but maybe use grey arms,too. I'm kind of digging the white arm idea. I'll try that. 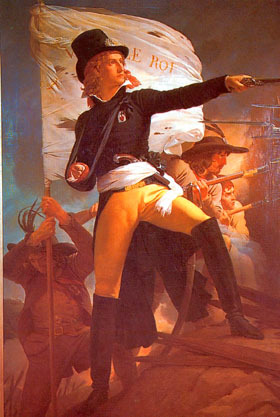 I used the white epaulettes as a reference to the Bourbon white flag. I am thinking I'll do between 30 and 60 of these guys. They look good.But I think if you use white arms there might be to much white. I did some a bit more diggin' and I would like to add another suggestion: the royalist uniforms incorporated greyish trousers. They could make up for the white if you'd like to use white arms. 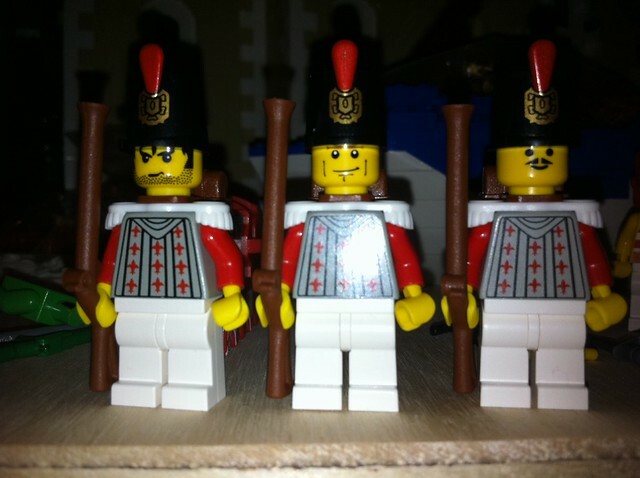 They were royalists and were fighting in the middle of the 1790's.they look a bit like your minifig. I have two suggestions though: white arms seems to be good, and flat hats, instead of those tall ones you have. Thanks for all the ideas and pictures! Here is another I took last night. I think I prefere the one with the white arms and backpack. Yes, the "white guy" ... grey is ok, but white works defenitly better. My suggestion is to use the guy on the far left but change the arms to red. Keep the hands white. Where do you go to order parts for all of your minifigs? I think they look great, those torsos are awesome. Thanks and thanks for not banning me too. I took only my ration of rum! I agree... what sets do those torsos come from? With that many Flor De Lis on them, no doubt they are french! Man, bricklink is the greatest thing since sliced bread! But it seems to me that army building would become a costly affair, just judging by the pirate figures I've purchased on there... At least with building an army of sailors for the 30+ ships in my Spanish Main game I'm free to have a more ragtag, non uniform group of scoundrels! Finally finished the 64 French Royalists that will fight alongside my British Troops. Hope you like them. First you see the 64 Royalists, then the rest stretching into the distance! Any updates on the fort? 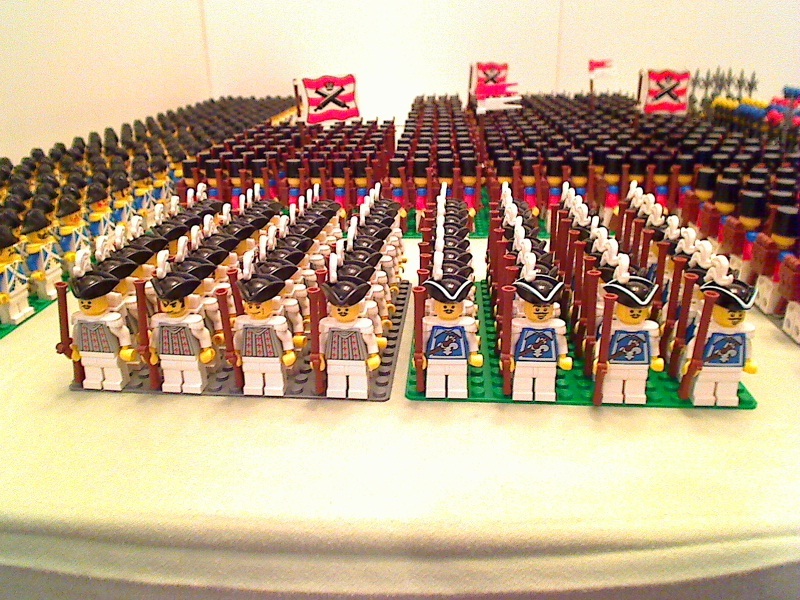 Now that's an army.....but where are the generals ? 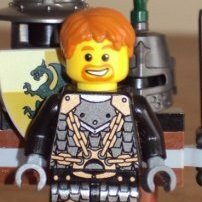 Brick On Fight On 'Commodore Hornbricker' ! Always remember.........Viva La Company ! Unfortunately it is still in the same condition as the last time I updated that thread. When I don't have time to build, which I haven't for the past year, I tend to army build. I ran out of room for the Generals and Admirals. Must be around 20 or so of them on each side. Hmm to be honest I think a custom decal would work much better here, however with the existing Lego torsos in mind I can understand your choice as it has something like the fleur-de-lys in it. The musketeers look great though! I do spot that only the first row has the new white printed hats! Maybe it would be a good idea to paint the rest by yourself? if you do it properly I think nobody would see much of a difference! By the way, the size of your army is very, very impressive!